The Salford Red Devils Foundation are delighted to have been announced as the Official Charity Partner of popular Manchester bar and restaurant Walkabout. The Australian themed bar set in their brand new location in the Printworks complex has established itself as one of the premium locations to watch rugby league in the city. 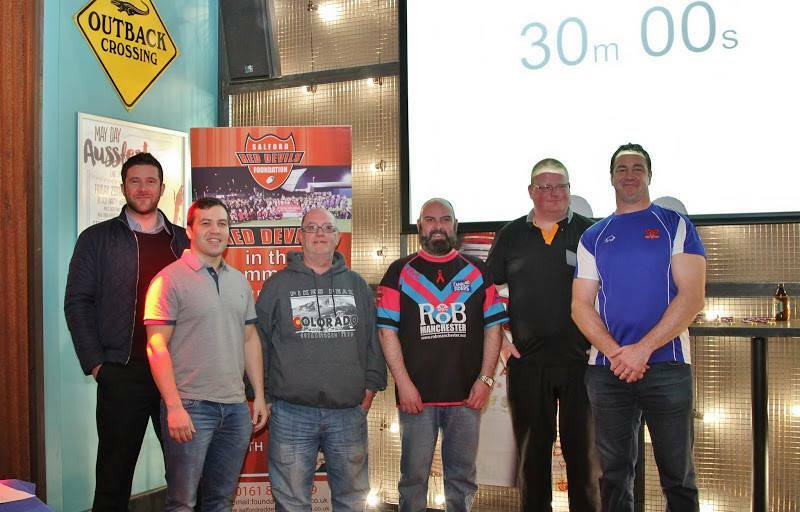 Walkabout already sponsor the club’s Head Coach Ian Watson, as well as Director of Rugby Tim Sheens, and this new partnership will not only strengthen the growing relationship between the bar and the club, but raise thousands of pounds for community programmes. To celebrate the launch of the charity partnership, staff from the Red Devils, featuring Club Ambassador Adrian Morley, took on a Walkabout side in their infamous Man vs Food Challenge. The Red Devils came out on top after eating a mammoth amount of food in the 30 min time slot. "It's great that we've been announced as Walkabout's official charity partners, with their support we'll be able to build on the community work we already do and fantastic to have such a big name like Walkabout on board"
For more information about the partnership, please visit www.salfordreddevilsfoundation.co.uk or call a member of the team on 0161 7861591 Alternatively visit http://www.walkaboutbars.co.uk/venues/manchester-the-print-works to find out how you can watch rugby league locally or take on the Man vs Food Challenge.